The Syria News Wire has MOVED!!! Write it on the back of your hand now. The Syria News Wire now lives at newsfromsyria.com. You will be redirected in 6 seconds. Hold tight. Forward Magazine has launched its own blog. It is probably the widest read Syrian magazine written in English. And it features the writing of the brilliant Sami Moubayed and Abdulsalam Haykal. Worth a read. Britain's Foreign Minister David Miliband is on his way to Damascus - as Syria's remarkable comeback continues. Miliband's visit comes after Walid Mu'alim made the trip to the UK last month. He's hoping to meet Bashar Al-Assad too. Yesterday Miliband said "There has been an important change in the approach of the Syrian government.” He praised Damascus for cutting the number of foreign fighters and weapons over the past year. It is Britain's highest-level contact since Tony Blair came to Damascus in 2001. Blair was humiliated when Bashar lectured him about suicide-bombing in a joint press conference. French President Nicolas Sarkozy made the first major hole in Syria's isolation when he invited Bashar to Paris to be guest of honour at the Bastille Day celebrations. Britain's been stuck to the Bush agenda of ignore-ignore-ignore. But with Bush on the way out, and Obama promising negoations with Syria, Britain has jumped into the let's-talk camp. But what's more interesting is speculation that Britain is trying to take the lead - and steal France's glory. A few years ago, the West was united in isolating Syria. Now those same countries are competing to be Syria's best friend. The winner of Best Arab Film at this year's Damascus International Film Festival is an odd choice. It is about a Syrian political prisoner. Out of Coverage focuses on the prisoner's best friend, and the prisoner's wife. His friend dedicates his life to trying to free him, and helping his family survive. But in the end, it becomes clear that he is the real prisoner - even though he isn't behind bars. Along the way, it also raises questions about corruption, wasta, and arbitrary detention. It is a brilliant film, and worthy of the award. But it is a mystery how it slipped past the censors, and then got singled out for a prize. Since it was made, Out of Coverage has been - literally - out of coverage. 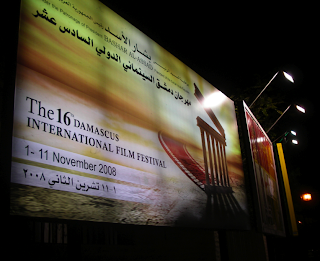 The DVD hasn't gone on sale and the film hasn't been screened at any Syrian cinema - until this year's film festival. Out of Coverage is now an award winning film on its home turf. But the story behind the film is even more interesting than the film itself. Out of Coverage. Writer/Director: Abdellatif Abdelhamid. Syria, 2007. 100 minutes. Something big is happening to your favourite Syrian news site. (That's this one, silly!). I'm going to ruin the end of this story, because it's one of my pet hates. AND THE BIGGEST CLICHE IN STORIES ABOUT DAMASCUS. "Modern-day travelers to Syria have their own conversion when they realize how much the country has to offer." To keep you entertained, here are a few interesting articles I've found (they're not all brand new). "When I told people at home that I was coming to Syria to study, they were really worried"
Newsflash - reporter finds foreigners in Damascus. "The Cham Palace in downtown Damascus — our home for the next week — somewhat dims our good mood. The cavernous lobby, defective neon lighting and sulky employees make you feel that you have somehow landed yourself in the Soviet Union of the 1980s. Furthermore, the hotel has the dubious distinction of allegedly having been the meeting place of al-Qaeda operatives and Iraqi insurgents back in 2003." Really offensive in some parts - but worth reading just for the people they meet, and the places they go to: Art House, Madina FM, Jebl Qasioun, Palmyra, Saida Zeinab. "The Al Kanar Group stations broadcast in the languages most common and most accessible to young Syrians. Al-Manar mixes Arabic – described as “a relaxed informal Arabic rarely if ever heard here in the past” – and English. Rotana FM broadcasts Arabic and French. Mix FM is all English language. MixFM was launched in March 2007 as the first 24 hour English speaking station in Syria. The use of informal Arabic has been a trademark of Syrian film and, most popularly, television." The first reliable piece about Syrian radio. George Wassouf has been released, after spending three days in jail in Sweden. He was arrested after a raid on his hotel. It's claimed he had been in possession of cocaine. Wasouf cried as the judge decided to free him. A crowd of fans gathered outside the court. As he walked out, he said: "I was framed and now I have been released." I started to critique this article because of a few factual errors. But it quickly became obvious something more sinister was at play. There were reasons for these errors. Malik al-Abdeh has written his first article for The Guardian. Unsurprisingly it is about Syria. Why do I say unsurprisingly? Because Malik al-Abdeh runs a group calling for regime change in Syria - but that's not mentioned anywhere on the page. He says of his organisation: "we propose a non-violent strategy, which targets the regime where it is most vulnerable: popular support." And it looks like he is using The Guardian as part of that propaganda strategy. "In its desperate attempt to emerge from isolation, the Syrian regime appears to have moderated its treatment of oppositionists to avoid further escalation with the west." Syria is generally accepted to have moved out of the period of isolation. It is not acting desperately. In fact, many claim it is cracking down on dissidents precisely because it feels emboldened. "Eight years on, the so-called "reformists" and the "old guard" have been shown to be one and the same." This shows a very basic ignorance of Syrian politics. The "old guard" have been involved in a sometimes quite visible battle with the reformists - take Aymen Abdel Nour for example, or the attitudes of Abdullah Dardari compared to Walid Al-Muallem. "Until he was temporarily reprieved by President Sarkozy, Assad's fate looked sealed." This ignores all of the developments of the past three years, and squeezes them into one incorrect sentence. It wasn't just Sarkozy. It was the EU (Javier Solana), America (Barack Obama, Jimmy Carter, and Nancy Pelosi), Spain (the King visited) and of course - Israel! Plus the Doha Accord, which brought Syria to centre stage in the region. There are a couple of intriguing sentences: "Despite its defiant rhetoric", followed soon after by, "It is very keen to get back in favour with the west." So which is it? But best of all, al-Abdeh's basic point of the article contradicts itself. He starts by saying: "Despite being courted by the leaders of France and Britain in the naive belief that he could be relied on to deliver the reforms expected of him." But then ends with a plea: "Now is the time for the west to press home the advantage by insisting on only conditional engagement with Syria, engagement which is made provisional on tangible improvements in human rights and political freedoms." He can't deliver reform. So now the west should demand reform. Syria's biggest singer is being held in Sweden, accused of having drugs. George Wassouf is one of the most famous in the Arab World - a sort of Arab Michael Jackson. There was a police raid on his hotel in Stockholm on Saturday night. It's claimed the forty six year old had 30 grams of cocaine on him. The raid happened just before a concert - which had to be cancelled. There have been rumours of Wassouf's drug addiction for years. His voice seems to have been affected by the problem.